Aera software uses artificial intelligence to identify ways to improve supply chain performance. 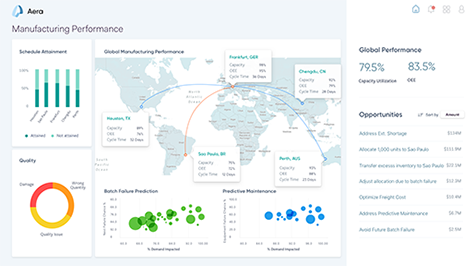 Business intelligence software provider FusionOps will rebrand itself as Aera Technology and launch a prescriptive analytics software platform for global supply chains after receiving $50 million in venture capital funding, the company said today. Mountain View, Calif.-based Aera also named Frederic Laluyaux as president and CEO, replacing company founder Shariq Mansoor, who will now take the role of CTO. Before joining Aera this year, Laluyaux had been CEO of Anaplan Inc., a vendor of cloud-based business planning platforms, and had held a number of executive positions with the German software giant SAP SE, according to the Aera Technology website. The investment was led by New Enterprise Associates (NEA), a Chevy Chase, Md.-based venture capital firm that had previously funded FusionOps with a $25 million cash injection in 2016. NEA has also funded a variety of logistics tech startups, including ClearMetal Inc., which applies predictive intelligence tools to container shipping firms, and Upskill (formerly APX Labs), a provider of enterprise software for industrial augmented reality (AR) wearables. Aera Technology also said it has launched a software platform—also called Aera—that is an extension of a product launched in 2016 by FusionOps. The platform uses artificial intelligence (AI) to identify opportunities to improve supply chain performance for customers such as manufacturers and enterprise corporations. The software monitors a company's existing enterprise resource planning (ERP), customer relationship management (CRM), and other systems and then generates automatic forecasts and strategies, Laluyaux wrote in a blog post. The firm said the software uses data crawling, industry models, machine learning, and artificial intelligence to understand how a user's business works, make real-time recommendations, predict outcomes, and take action autonomously. "The leap from transactional automation to cognitive automation is imminent, and it will forever transform the way we work," Laluyaux said in a statement. "At Aera, we deliver the technology that enables the self-driving enterprise: a cognitive operating system that connects you with your business and autonomously orchestrates your operations." Editor's note: This story has been updated to reflect that Frederic Laluyaux will replace Shariq Mansoor. Feedback: What did you think of this article? We'd like to hear from you. DC VELOCITY is committed to accuracy and clarity in the delivery of important and useful logistics and supply chain news and information. If you find anything in DC VELOCITY you feel is inaccurate or warrants further explanation, please ?Subject=Feedback - : FusionOps rebrands as Aera Technology after landing $50 million in venture funds">contact Chief Editor David Maloney. All comments are eligible for publication in the letters section of DC VELOCITY magazine. Please include you name and the name of the company or organization your work for.